Lasko’s commitment to quality and social responsibility attributes to its rapid rise and consistency in the market. The company has existed in the US since 1909 where it specialized in air conditioners and wind machines. It is almost unbeatable due to the established name and loyalty across the world. The manufacturer categorizes this as an air circulator. 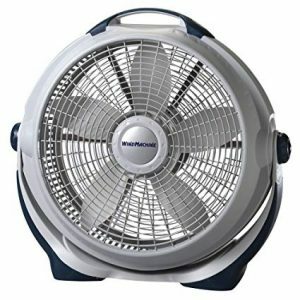 The Lasko wind machine is exemplary because of its numerous functions. The old model that is box shaped is best suited for homes. The power and design of this wind machine cannot fit in an agricultural or industrial setting. It can either be used to pull air into the room, out of the room, or circulate air within. All this is dependent on how you install the wind machine; you can either mount it on a wall or place it on top of a stool in your living room or bedroom. 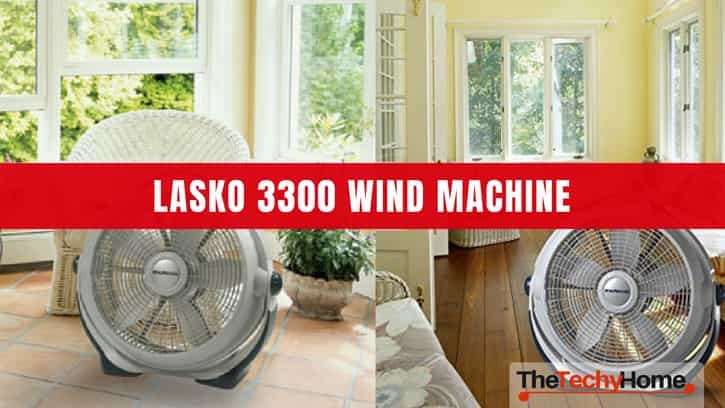 Lasko wind machine easily fits in windows; you don’t have to worry about size of the window, Lasko 3300 is adjustable. 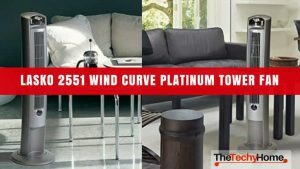 The pivoting element of the wind machine make sit suitable for any room. It rotates at 360 degrees hence flexibility in mounting on any type of window to achieve different purposes. When installing the Lasko wind machine, you don’t have to worry where it should face. While it does not have the oscillating element, pivoting allows you to aim either the floor or ceiling. The Lasko wind machine does not have a remote. This might be deal breaker for many. However, the manufacturer covers this “deficiency” with large and easy to use controls. On the side of the wind machine, there are well labelled and nice looking control buttons and switches. It does not require an special skill or knowledge in the industry to understand controls on this appliance. On the back cage, there is motor housing where a knob is fixed for mechanical control. The twist knob helps in mounting off/on of the wind machine in case you need to shift its location. The knobs also helps in positioning the wind machine on the ground by tightening from two points; the two handle points are at 3 and 9 o’clock. 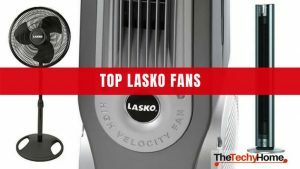 The pivoting head is the most notable difference in this Lasko wind machine. The manufacturer must have thought of a creative or cheaper way of uniformity of airflow. Flexibility of the head by manual adjustment is a replacement for the common oscillating fans and air conditioners. The wind machine is unique on this basis. With the two knobs on the pivoted head, you can either adjust the wind machine to face up, down, right, or left depending on room orientation and temperatures of the moment. If you judge Lasko 3300 by its appearance then you are off the mark. Just like most of box fans, it looks hefty and less stylish. However, do not underestimate its power and performance because of its size. The consistency in airflow and uniformity is amazing. 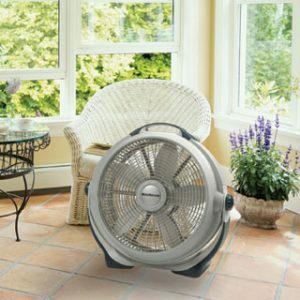 While it may not function like an industrial fan or powerful equipment, you see in warehouses, this is more than enough for home use. 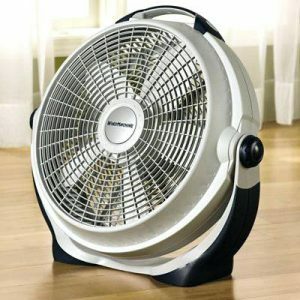 Be sure to get an appropriate wind machine size depending on size of your house or office. In fact, it is not recommended for use in garages and industrial settings because of its limited power when it comes to required airflow in a manufacturing setting. The manufacturer offers limited colors for this winding machine. You have to choose between blue, gray, or white. If you are concerned about décor and appearance, then you might want to consider before placing your order. Lasko 3300 is fairly attractive; you won’t find any trouble placing it one corner of your living room. The color and pivoting design can be creatively utilized to achieve unique home décor. The winding machine is easy to use. As mentioned, the controls are well labelled and large enough to ensure you don’t miss any setting. Nevertheless, the manufacturer provides a detailed manual in case of clarification. The manual is only for precaution and probably policies in the industry; otherwise, you won’t need it at all. If there is need to disassemble this winding machine, you better consult an expert in the industry or preferably from Lasko for proper diagnosis and solutions. This is no hint to breakdown of Lasko 3300. 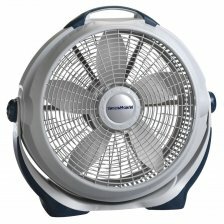 In fact, it is one of the strongest models among Lasko wind machines. When making an order, you will be required to specify on whether the type of material; aluminum, steel, or plastic. Contrary to common belief, the plastic is thicker and tough. You might want to buy a plastic Lasko 3300 because of its appearance. The shiny surface is noticeable from distances; if it is standing in your living room, everyone will notice despite its size. Remember this is an air circulator. Do not expect a timer, thermostat, or fancy digital controls. It is primarily for moving air.